RUSH: Mr. Snerdley. Snerdley didn’t believe the Jill Abramson/Obama doll story. I’m gonna read you what she wrote. It’s in The Guardian, not the U.K. Guardian. It’s American. The Guardian. It’s some radical, left-wing, Stokely Carmichael kind of rag, okay? “It’s easy to look at what’s happening in Washington D.C. and despair. That’s why I carry a little plastic Obama doll in my purse. I pull him out every now and then to remind myself that the United States had a progressive, African-American president until very recently. “Some people find this strange, but you have to take comfort where you can find it in Donald Trump’s America.” Now, some people are say, “This just proves that we had a Democrat operative running the New York Times.” We didn’t doubt that. What this is proving is that these people are children. You know what this really boils down to? The left is really a bunch of spoiled-rotten kids. I don’t care how old they are, they are basically spoiled-rotten children, crying if they don’t get their way, despairing if they don’t get their way. Hillary Clinton may be one of the sterling examples of this. She has been on a world tour to explain why she should have won and how the election was stolen from her — and I’m telling you, she must really be taking this hard. I mean, we knew that. But it’s been a year and a half now, and to her, it’s just like it happened yesterday. We have a couple of sound bites. Saturday in Mumbai, the India Today Conclave, Hillary Clinton during the Q&A was asked about the 2016 presidential election. HILLARY: If you look at the map of the United States, there’s all that red in the middle are Trump won. I win the coasts. I win, you know, Illinois, Minnesota, places like that. But what the map doesn’t show you is that I won the places that represent two-thirds of America’s gross domestic product. HILLARY: I won the places that are optimistic, diverse, dynamic, moving forward — and his whole campaign, “Make America Great Again,” was looking backwards. You didn’t like black people getting rights. You don’t like women, you know, getting jobs. You don’t want to, you know, see that Indian-American succeeding more than you are. Whatever your problem is, I’m gonna solve it. RUSH: Now, there was a time I would have given her a pass on this. A month or so after the election, it’s gotta be emotionally shattering. But this is just beyond the pale. This woman, I think, is constantly bitter. I think happiness has never found this woman. I really believe it — and in some ways, you can understand it. You know, look at what a horn dog husband is. (snorts) I was… You know, I have to tell you this. Somebody suggested to me if you have some free time, watch episodes of The Shield, the old FX crime show starring Michael Chiklis. And it’s about a dirty cop who tries to be dirty for the good of his community, Farmington section Los Angeles. Some of the best slang conversation and lines I’ve ever heard. And I’m watching… I watched one Saturday, I have some time to kill, and I’m watching it, and one of Vic Mackey’s boys has got some perp, and he’s walking him to the bus, and he says, “What did you think you’re gonna get, a back-alley Clinton before I took you in?” (laughing) “Back-alley Clinton! (laughing) I hit the pause, I rewound it two or three times and looked at it. These lines are just coming left and right. But stop and think! This woman just cannot be happy, and nothing that she said could be further from the truth. She won places that represent “two-thirds of America’s gross domestic product … places that are optimistic, diverse, dynamic, moving forward”? She won California, New York, New Jersey, Illinois, Massachusetts, Washington, New Mexico. She won the areas that are filled with paranoiacs and with people who are perpetually enraged and angry! But what this really tells us is what Hillary thinks of this country — and not just Hillary, but what the entire Democrat Party thinks of this country. Where she says, “[H]is whole campaign, ‘Make America Great Again,’ was looking backwards,” I hope you people who are doubting me when I describe Obama’s view of this country as America’s great days were unjustified, unwarranted, because they were illegitimate… They were illegitimate in his view because our founding was corrupt. Our founding was unjust and immoral — and our greatness and our superpower status undeserved — because we built it on the backs of the poor and the deprived and minorities. And we’ve stolen from everywhere in the world, and there’s no such thing as American exceptionalism, she comes along here and says, “[H]is whole campaign, ‘Make America Great Again,’ was looking backwards”? We had lived through eight years of this country stagnating on purpose. We were languishing, and we had no national purpose other than for Obama to spearhead and manage the decline. “You didn’t like black people getting rights. You don’t like women, you know, getting jobs. “You don’t want to, you know, see that Indian-American succeeding more than you are. Whatever your problem is, I’m gonna solve it.” She has just described what she thinks of this country, and she’s already told us once when she talked about the deplorables. But that was everybody that wasn’t gonna vote for her, and this is not just Hillary. I maintain to you that this is what the Democrat Party thinks. This is the stupidity that we’re up against. They really do believe that Trump and his supporters don’t like women, don’t like black people getting rights. Well, here we just have the first female CIA director, and they’re trying to destroy her — Hillary’s people are — on the basis that she presided over torture. It’s under Trump that African-American unemployment is near record lows. Not under Obama. Not under Bill Clinton. African-Americans are working in greater numbers and they’re all getting raises, bonuses, tax cuts — and then there’s more. We’ve got one more sound bite here. This is another version of why she lost. She got a question from the moderator. HILLARY: We do not do well with white men, and we don’t do well with married white women. Part of that is ongoing pressure to vote the way that your husband, your boss, your son, whoever, believes you should. All of a sudden, you know, white women who were gonna vote for me and frankly standing up to the men in their lives and the men in their workplaces were being told, she’s going to jail, you know, you don’t want to vote for her, you know, it’s terrible, you can’t vote for that. RUSH: Does this woman say “you know” every other sentence? You know, you know. She’s supposed to be such an accomplished speaker and the smartest woman in the world, you know, you know, you know. It’s starting to drive me crazy, she does it so much. But then the substance of this. What must she think? She despises you women who are married. She despises you and look at how she insults you. She’s out there telling people that we don’t like blacks and we don’t like women and we don’t like people of color. Look at what she thinks of you, that whatever your husband tells you to do, you do. Whatever your son tells you to do, you do. Whatever your male boss tells you to do, you do, because you’re a gutless b-i-itch in Hillary Clinton’s world because you didn’t vote for her. It can’t be that you didn’t like her. It can’t be that you didn’t see that she was wonderful. It can’t be that you think she’s a fraud. It can’t be that you think she’s nowhere near qualified. No. It has to be because you’re spineless and you’re afraid of your men, and your men are a bunch of predator, mean-spirited extremist abusing guys, and they’re punishing you if you don’t do what they tell you to do. This is outrageous! A year and a half later, she can’t get over it. Look, I know it was tough. Everybody in the world thought she was gonna win, but in the process we’re learning who this woman is. Well, we’ve known ever since she came on the public scene, but a lot of other people are now getting a taste of it. This guy, so you’re up there yapping away, but 52% of white women voted against with you. How do you explain that? Well, part of that’s ongoing pressure to vote the way your husband, your boss, your son, whoever believes you should. All of a sudden, you know, white women who were gonna vote for me, frankly, standing up to the men in their lives, and the men in their work. So, a white woman voting for Hillary was a woman standing up to the man in her life. What must she think relationships are? She must literally believe that most American married women are abused, dominated, mistreated, and for her to have had any chance at all, these women were going to have to stand up to their husbands and to their fathers and to their bosses. This woman is pathetic. The idea that this woman could ever have the label smartest woman in the world is laughable. She is a fraud. She is not anywhere near the smartest woman in the world, and she’s not even a brilliant political tactician. And she couldn’t even win with one of the biggest political hoaxes that anybody’s ever run. She couldn’t even win with one of the biggest political scams, this idea that Trump colluded with Russia. She enabled the FBI to use an opposition research document as legitimate intel, and she still lost. This woman has been rejected pretty much every time the people of this country have had a chance to accept her. She is the most cheated-on woman in America, and she’s getting close to being the most rejected. So I can understand her anger, to a certain extent. But these kinds of excuses, these flimsy little excuses. But, folks, this is not the piece de resistance, because there is a video — not gonna play you a video, but I have a couple of still shots I want to show you if you’re watching on the Dittocam. We’ll have ’em later at RushLimbaugh.com. Hillary Clinton was visiting the Jahaj Maha in Mandu. She was attempting to walk down about 15 stairs. She was holding the arm of– there were two guys on each side with Huma bringing up the rear. 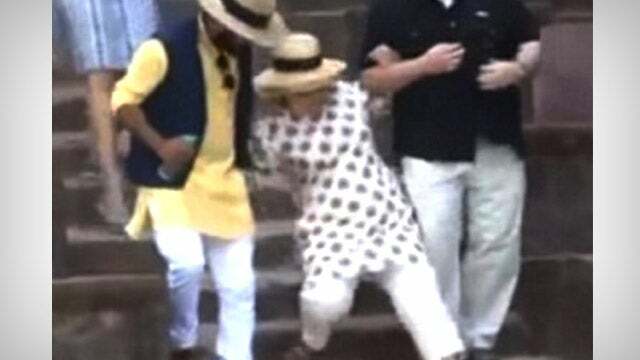 I understand Huma not walking in front of her because if Hillary falls Huma’s gonna get hit like a bowling pin and they’re both gonna end up rolling to the bottom of the staircase and it’s concrete and steps, it would not have been a pretty scene. There’s Huma there with Hillary splattered all over her, nah, don’t want to even picture it. So Huma, she’s bringing up the rear watching as though this is not uncommon. So with Huma following, Clinton slipped about halfway down, nearly tumbling. Throw the first picture up there, you’ll see it on the Dittocam if you’re watching. We’ll switch to it here. Soon as our switcher starts switching. Does our switcher not switch today? There it is, Mrs. Clinton in the polka dot muumuu. That’s her with these two burly guys. She is about to fall. Huma is in the powder blue muumuu behind her. Well, it’s not a muumuu, it’s actually a shift. And they’re both wearing these gigantic straw hats. 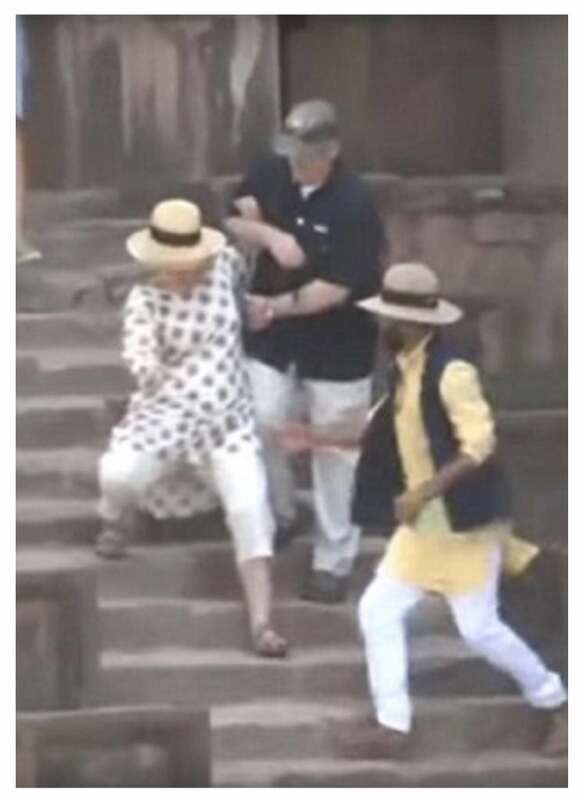 She’s anchored by two burly guys, one on each arm, and she still slips, and that left leg is extended straight, she’s almost about to go all the way down. There’s another photo of this that is I think the next frame and we’ll switch to it now. Oh, I’m sorry. This is the first photo. She begins to slip, and the guy in yellow is rushing up there to join the guy in black. This is where Mrs. Clinton began the next — the first picture we show you is actually number two where she almost does the splits. She can’t even stand up on her own! She was wearing sandals here. She had to take the sandals off to finish the trek. Yeah, there is photo number two, as the guy in yellow has made it to her right, arm is propping her up. And Huma looking on like, hey, what’s unusual about this? Nothing.